Goldspot sardine larvae (Herklotsichthys quadrimaculatus) were raised from wild-spawned eggs at 77-79F on wild copepods and artemia. First record of Goldspot sardine culture. 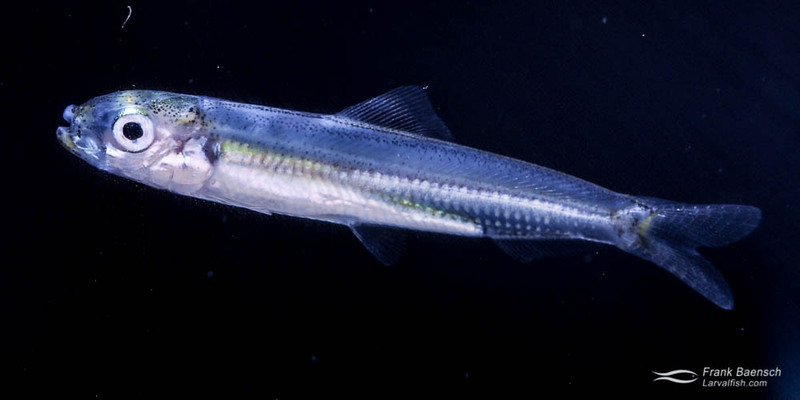 Sardines are silvery, schooling fishes found worldwide in warm and cold seas. Many sardines are ecologically & commercially important. Sardines are not native to Hawaii. The Goldspot sardine (Herklotsichthys quadrimaculatus) is named for its yellow spots at the gill opening. The species was unintentionally introduced in the 1970’s and is now common in Hawaii, forming dense schools in harbors and protected bays. H. quadrimaculatus disperses at night, spreading over the reef to feed on plankton. Eating whole H. quadrimaculatus fish should be avoided as it causes severe Clupeoid poisoning. H. quadrimaculatus grow to about 5”. Goldspot Sardine (Herklotsichthys quadrimaculatus) larvae and juveniles reared in the laboratory. H. quadrimaculatus was raised from eggs collected with a plankton net in Kaneohe Bay, Oahu, Hawaii. The eggs are pelagic and were not measured but appeared to be about 4-5 mm in diameter, which is considerably larger than the size reported for sardines (0.8-2.1 mm). H. quadrimaculatus larvae measure about 6.5 mm TL at hatching. They turn silver and begin to school about 21 days when they measure about 30 mm TL. H. quadrimaculatus larvae are not difficult to raise when they are fed wild zooplankton through the larval period.